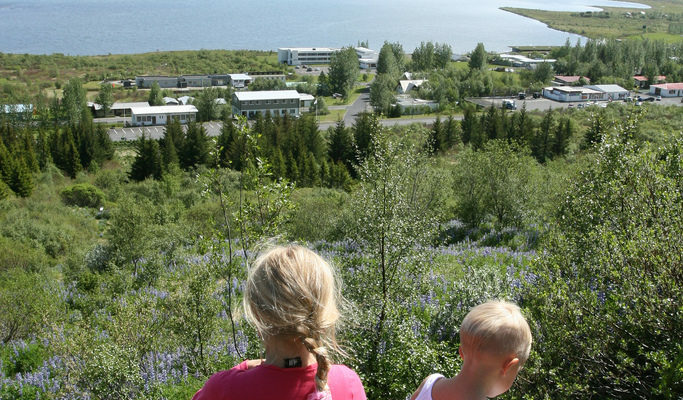 Laugarvatn, a village that has grown around a number of schools: a junior college, an intermediate school, The College of Physical Education and an elementary school. This is a geothermal area, and it is said that when Christianity was legalized in the year 1000, the chieftains from the north refused to be baptised in the cold waters of Þingvellir, and were brought to Laugarvatn to be baptised in the warm spring, Vígðalaug (“Consecrated spring”). Three children were baptised in Vígðalaug at the celebrations in 2000 commemorating the conversion of Iceland. A natural steambath, Fontana reopen in June 2011 with sandy beaches by the lake. A popular camping area in summer. Beautiful walking routes in the area. Laugarvatn, a lake, 2,14 km2, with geothermal heat on the banks and the bottom, mostly shallow and rich in plant-life.